Italian food is the most popular ethnic food in the United States, but Mexican food is gaining rapidly with a 10 percent surge of adults naming it their favorite, according to data published by the Institute of Food Technologists. · Four of 10 restaurant-chain chefs think portion size will be a new major trend. 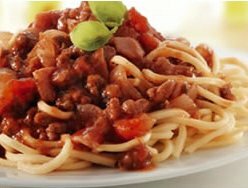 More than 3 in 10 expect comfort foods, such as meatloaf, macaroni and cheese or pot roast, to be a driver. · No-fat and low-fat foods have slimmed to single-digit growth, but it's still a $32-billion segment--more than twice the size of the widely acclaimed organic foods category. · Coffee is the No. 1 consumed breakfast food. Fully 53 percent of Americans begin their day with a cup of java. Now quick service restaurants are bringing designer brands to their menus. · Vegetable consumption is falling by 2 percent, but fresh fruit is rebounding after 14 years in decline. Fresh fruit is the No. 1 snack of kids age 2 to 12. Anyway, there are always even more interesting facts, stats, and basic info on the way we eat and why in Food Technology magazine. Interesting stuff. Okay, that's all for now and I'm officially outta here for this week. Make it a great weekend, gang. Peace. Best-selling novelist, renowned chef, and the outwardly "food opinionated" host of the Travel Channel's No Reservations, Anthony Bourdain has some rather distinct tastes when it comes to the music he enjoys outside the kitchen. His playlist includes an eclectic dash of classic soul with some tasty pre-punk nuggets -- followed by some flavorful jazz pieces to sweeten the mix. So Anthony, is it really any wonder that I've always referred to you as a guy after my own li'l ol' foodie heart? 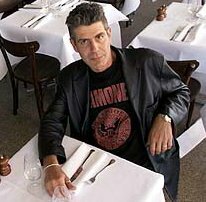 Anyway, you can download Chef Bourdain's picks at Rhapsody.com. And although I have to say that he totally grossed me out cold about a week or so ago in one of his "extreme eating" segments with those cute little hamsters that are a popular lunch delicacy in the remote areas of Peru (talk about pet shop cuisine -- Yikes! ), if you think you've got the stomach, as well as the b---- oh, well, never mind, be sure to tune in and follow Bourdain's world food travels on No Reservations every week on the Travel Channel. Check local listings for exact times. Well, it seems I'm still in writer's conference-mode, and we certainly had a great one at Scandinavia House here in NYC this past weekend. Clearly, a good time was had by all. Now, it's off to get back into the reality of the weekly grind. (Ugh) Enough said. Make it a great Tuesday, all. Peace. You can download a brochure, or get more information on this or other upcoming conferences at the events page on our website. And that'll be it for me here this week. Make it a good weekend, all. Peace. I've been tuning in this week to the much-touted Celebrity Cooking Showdown , with a bit of disappointment after each segment, I'm sorry to say. And throughout these airings, I can't help thinking: It was an interesting idea to begin with (or, at least as interesting as reality TV can be these days), but hey, Sean "P. Diddy" Combs and the other producers who are backing this program -- what's up?? Clearly, to pin the term "lackluster" on this one, would be somewhat of a definitive stretch, to say the very least. Still, it's great to see Govind Armstrong on board, as my last time seeing him was during his Iron Chef battle against Bobby Flay last year. A protege of Wolfgang Puck, starting at the tender age 13, these days Armstrong keeps himself busy, traveling the world as a consultant chef to Air New Zealand, a member of the Marshall Fields/Macy's culinary advisory board, guest chef aboard the Queen Mary 2 and Crystal Cruises and as a culinary ambassador to New Zealand. Additionally, he's been making a wide range of media appearances from print (People Magazine's 50 Most Beautiful Issue, Bon Appetit, Gourmet, O Magazine, etc.) to television (Iron Chef America/Food Network, The Today Show/NBC, Great Domestic Showdown/ABC, Extra, Bravo, Style Network, Fine Living, WE, etc.). Armstrong also keeps busy by serving as partner and executive chef of Table 8 in Los Angeles. Up next for Armstrong are a variety of restaurant projects, including the June opening of Table 8 South Beach as well as openings of Table 8's in San Francisco, New York and Las Vegas respectively. By the way, he's also just finished his first book to be released by Clarkson Potter/Crown in early 2007. As for Celebrity Cooking Showdown...well, I guess I'll just have to stay tuned. Perhaps tonight will be the dynamic turnaround for this show, who knows? I sure hope so. Make it a good Wednesday, all. Peace. With only a few seconds to be officially out-the-door this morning and on my way, I'll just give that long overdue mention to this year's Next Food Network Star competition. 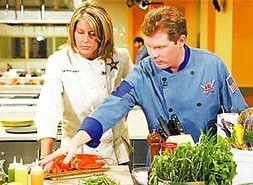 Even though for me, last year's battle for the coveted title was slightly more interesting, this year found me totally liking San Diego native and graduate of Le Cordon Bleu, Carissa Seward for the big win. And just for the record, there's no high and mighty culinary issue going on here, regardless of Carissa's time spent at the prestigious institution. She very openly states that watching her mom while growing up, and tooling around in her own kitchen (and sometimes "screwing up") were her greatest inspirations. But now that Carissa has been eliminated, and I must add, after preparing the most delectable-looking set of dish presentations at the CBS Early Show challenge (yes, I think this counts just as much as how well one can schmooze up a morning show host with a lot of empty chatter over the grill pans), I really think it could go either way for the remaining two contestants, Reggie Southerland from Los Angeles and Guy Fieri from Santa Rosa, California. Meanwhile, if you don't already know that much about her, them -- or the competition itself, of which the prize is the winner's very own Food Network cooking showcase starting in June 2006, read more about it here. Quickly adding to that, the season finale and announcement of the winner happens this Sunday, April 23rd at 9PM EST. Keep on rocking, Carissa -- and best of luck! I'm sure that from what many have seen, the only way for you, is upward. · The first chocolate eggs were made in Europe in the early 19th century and remain among the most popular treats associated with Easter. · 90 million chocolate Easter bunnies are made for Easter each year. · 16 billion jelly beans are made for Easter. · Each day, five million marshmallow chicks and bunnies are produced in preparation for Easter. · Easter is the second top-selling confectionery holiday behind only Halloween. 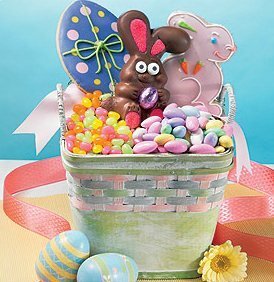 · 88 percent of adults carry on the Easter tradition of creating Easter baskets for their kids. · 76 percent of people eat the ears on chocolate bunnies first. · Red jelly beans are kids' favorite. · According to the Guinness Book of World Records the largest Easter egg ever made was just over 25-ft high and made of chocolate and marshmallow. The egg weighed 8,968 lbs. and was supported by an internal steel frame. I also don't mind giving them a quick mention here, as I've ordered from them before, and needless to say their festively arranged products and services are clearly worth it. So even if you're a little late with an Easter order, don't sweat it. Order something anyway, either from them -- or from wherever you chose. These items make terrific spring gifts, even if they do manage to show up a few days later. After all, it's really about showing your love for those who occupy the * special * places in your life, and nothing else. Have a fantastic Easter weekend, gang! Peace. The winners of Food & Wine Magazine's Best New Chef title are 10 up-and-coming chefs nationwide who have now earned this distinction. These 2006 winners will also be featured in the annual chef issue, available on newsstands June 15. And of course, special kudos and praises go out to Chef Mary Dumont (mentioned and pictured above) for winning this coveted title. No doubt, and as always, for me the recognition of outstanding females in the profession is a notably *refreshing* thing to see. The Top Ten will cook together for the first time at an exclusive tasting dinner at the 2006 F&W Magazine Classic in Aspen, June 16-18, 2006. 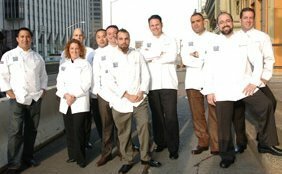 Past F&W Best New Chefs who have gone on to greater culinary heights include: Thomas Keller, Nobu Matsuhisa and Daniel Boulud. Congrats to all of this year's rising stars. 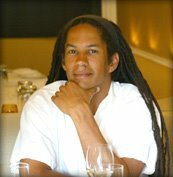 For that, I think one should at least consult an expert on the subject, perhaps even a noted authority like San Francisco's superstar sommelier, Larry Stone (pictured above), wine director of the Rubicon restaurant in San Francisco. Larry Stone is a two-time recipient of the James Beard Award for Outstanding Wine Service and the first American to win the title of International Best Sommelier in French Wines and Spirits in Paris. He also remains the only American to have earned the title of Maître Sommelier from the Union de la Sommellerie Française. With Easter and Passover just around the corner, his picks are on-point for wine lovers of all sorts -- so make sure to check it all out in the links provided above. By the way, among his red wine picks for spring, Larry just happens to suggest one of my personal favorites: Chianti Rufina (an orange and nutty flavored aromatic from the Tuscany region of Italy that's moderately priced here in the U.S. -- and totally unequalled). Have a good pre-Easter Monday, all. Peace. We're talking auto racing -- of course, and taking a cue from the dedicated NASCAR fans in my household (well, okay...mainly through the miracle of a wide-screen TV and *post* football season), I'd just like to give a quick plug to Food Network's Mario Batali , on his recent appointment as the organization's "official chef." 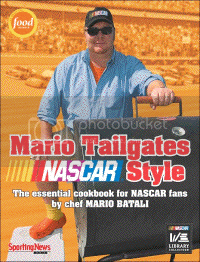 A longtime NASCAR fan himself, Mario's latest written offering, Mario Tailgates NASCAR Style, just hit the bookstore shelves on Tuesday, and is also an officially licensed NASCAR cookbook. With its easy recipes and clear, simple instructions, Mario's new "cooking NASCAR" effort is the source for tailgating for fans around the country. It features regional favorites and classic grilling recipes on which Mario has put his signature spin. Included are ideas for breakfast, appetizers, main courses, desserts, and drinks, all incorporating ingredients found in almost any supermarket. Written with Mario’s usual wit and candor (both masterful and often times priceless), and punctuated with racing lore, this book allows everyone to cook great-tasting food with ease and have the folks tailgating next to you longing for leftovers. Along with the standard crowd-pleasers such as barbecued chicken wings, burgers and ribs, all of which can be enjoyed in a parking lot or backyard patio, I have to admit that some of the dishes with an ethnic twist, such as Queso Fundido (a Mexican cheese creation) and Thai Flank Steak sound downright tempting for either the racing OR the *football* tailgating crowd (which is probably when my husband will very politely remind me -- again -- about this book). So stay tuned. More dish about that later on in the fall months, I'm sure. Celebrity super chef, Mario Batali, is also the owner of several upscale restaurants. One of them, is his popular flagship eatery Babbo Ristorante, here in New York City. And that's all from me this week. Have a super weekend, gang. Peace. That's the correct name I'm told, and it appears to be the very latest thing on the literary scene these days. The Blooker Prize is also the world's first prize devoted to "blooks": books based on blogs or websites. Sponsored by Lulu, the awards are in three categories: Fiction, Non-Fiction, and Comics. As many in the blogosphere already know, Powell, a 30-year-old secretary living in an apartment in Queens, New York, spent 365 days cooking all 524 recipes from Julia Child's Mastering the Art of French Cooking. Soon afterward, she became an instant Internet celebrity with her 2004 blog chronicling her yearlong odyssey of cooking every recipe in Child's all-time classic cookbook. Powell originally embarked on the "Julie/Julia" project to find a sense of direction, and both the cooking and the writing quickly became all-consuming. Many passages in the book are taken verbatim from the blog, but Powell expands on her experience and gives us generous amounts of background information about her personal life, including her family, friends, and her sometimes less than likeable co-workers. She also includes some comments from her "bleaders" (blog readers), the ones who ultimately formed an enthusiastic support base. 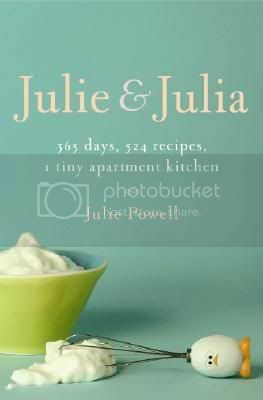 As a reader of Powell's famous blog a few years ago, and a forever lover of the late culinary master, Julia Child, I felt compelled to buy Julie & Julia when it first hit bookstores in September of 2005. Without a doubt, and thoroughly dispelling all criticisms against what we've now come to know as "blooks," Powell's writing is both stimulating and entertaining, making this book another one of those must-haves on every modern book shelf. Huge congrats on this, Julie. Has it been good, or bad for business? Several top NY restaurant owners and operators weigh in on the subject here in New York Magazine's recent impromptu poll. Surprisingly, there are some rather interesting responses, including one from celebrity chef (and ex-smoker), Mario Batali. It's Monday again, gang. Make it a good one, along with an even better week. Peace.